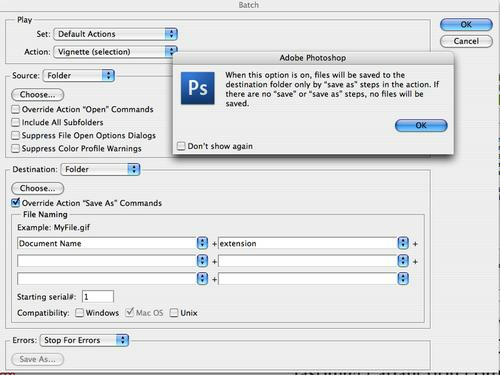 Batch actions in Photoshop...some halp? I think I've finally nailed down my workflow, but I'm running into an issue with saving. I import straight from my cards into Lightroom (in RAW), do any edits there, then if I'm putting them online, export to Photoshop to resize/border/save. However, I can't seem to get an action for saving how I want down. Usually all I do is convert to .JPG and add a "b" to the end of the filename to designate it. However, PS won't do that...in the batch tool, I have the option to save after an action, but it won't let me change the filetype, so it saves as a .TIFF. If I try to create an action specifically for saving, it will try to save as the exact filename I specified when recording the action. Can any photo/GD monkies offer any help/suggestions? It's not really a problem when I'm only pushing a 20 photo set, but when I've got 150 I need to post to a private gallery for a client, it's an issue and a huge time waster. Ooooh...I thought that did something else. Let's see if it works. edit: Didn't work. Still tries to overwrite everything. Try Mogrify! I use and it works well and is way quicker than doing that stuff in photoshop. It lets you export images from lightroom with borders, a logo, text, etc. You could designate it to save to a separate folder and then just use a file renaming application to add to the name as wanted. Oooh...fancy. Didn't seem to work with my version of LR, but I just downloaded the new beta, maybe it will work with that. I'm using that with Lightroom 1.4? They have the one for version 2. Dl'd LR2 and it does nearly everything the plugin does without the 10 image limit...except borders. you can call an action from that as well. btw, borders and watermarks are ghey.